This article’s long, so I’ll spare you a lengthy intro. Here’s everything you should need to know in order to dominate your Week 9 DFS tournament and cash games. Note: All numbers in parentheses refer to a player’s salary rank on each site. Demaryius Thomas and his 7.0 targets per game were traded to Houston right before the trade deadline. This boosts Emmanuel Sanders (DK: WR14, FD: WR13) and presents a massive opportunity for Courtland Sutton (DK: WR47, FD: WR37). Sutton is a must-play in cash games and projects to draw hefty ownership in tournaments this week, but it’s not without good reason. Per Ian Rapoport, “It’s Sutton’s time.” Per Jeff Darlington, “Denver believes Sutton is ready to be a star.” Sutton hasn’t seen great target volume but does rank fifth in end-zone target market share (42%). He also has the matchup in his favor, up against Houston. The Texans are giving up the fourth-most fantasy points per game to opposing wide receivers lined up to the left, which is where Sutton runs over half of his routes. Golden Tate was traded to the Philadelphia Eagles, boosting the fantasy stock of both Marvin Jones (DK: WR21, FD: WR20) and Kenny Golladay (DK: WR20, FD: WR25). Both rank between WR20 and WR25 in salary on both sites, and also rank top-23 in fantasy points per game on both sites (of the wide receivers on the main slate). Now, with Tate’s 9.9 targets per game and 25.5% target market share out of the picture, both are glaring values. Ryan Fitzpatrick was announced as Tampa Bay’s starter earlier in the week. I’ll detail Fitzpatrick’s fantasy potential later, but for now I want to focus on his wide receivers. One of the secret keys to this slate might be the value boost to Tampa Bay’s wide receivers via Fitzpatrick. As I’ve ranted about elsewhere, Jameis Winston is one of the league’s most efficient quarterbacks when targeting tight ends and one of the league efficient when targeting wide receivers. Of course, this carries over to production as well. Since Winston entered the league in 2015, there have been 24 quarterbacks to attempt at least 1,200 passes. Over this span, 30.1% of Winston’s passing fantasy points have come when targeting tight ends, which ranks fourth-most of those 24 quarterbacks. Fitzpatrick ranks last with 8.3%. Meanwhile, 78.4% of Fitzpatrick’s passing fantasy points have come when targeting wide receivers (most), while Winston’s 56.7% ranks sixth-lowest. Using 2018’s numbers (here), DeSean Jackson (DK: WR28, FD: WR17) averages 21.9 fantasy points and Mike Evans (DK: WR4, FD: WR6) averages 27.6 per 40 pass attempts with Fitzpatrick. That’s, respectively, 13.6 and 14.7 more than with Winston. Dalvin Cook is expected to play on Sunday, coming back from a hamstring injury. You might think that that would put a dent in Latavius Murray’s (DK: RB16, FD: RB12) projections, but I’m not so sure. Per ESPN beat writer Courtney Cronin, Cook will only be available for “around eight to 12 plays.” Considering Minnesota runs roughly 67 plays per game, that’s only a snap share of 12-18%. With Murray playing on 83% of the team’s snaps over his last three games, Cook’s return might not impact his usage at all. If Cook’s return scares enough people off Murray, that could make him one of this week’s top contrarian plays. Murray has been tremendous in recent weeks, averaging 5.38 yards per carry, 20.0 touches per game, and 21.9 fantasy points per game over his last three games, and now has an ideal matchup. Detroit’s defense ranks 32nd in both yards allowed per carry (5.53) and rushing yards allowed per game (136.0), while ranking 10th-best in passing yards allowed per game (245.9). Allen Robinson looks unlikely to play this week. I don’t think that really moves the needle for me, but it does push Anthony Miller (DK: WR51, FD: WR40) into consideration as a punt option. Miller saw a team-high seven targets last week and runs 70% of his routes from the slot. Buffalo is giving up the eighth-most fantasy points per game to slot wide receivers but the fifth-fewest fantasy points per game to outside receivers. Torrey Smith is out for Week 9, which makes rookie D.J. Moore (DK: WR36, FD: WR43) an intriguing option. Last week, with Smith out, Moore saw a season-high 71% of the snaps and a team-high six targets (for 90 yards). Although he ran only 24% of his routes from the slot, he did see a team-high four targets there. Tampa Bay is giving up the most fantasy points per game to opposing slot wide receivers. He’s a good but not great play. Theo Riddick is active this week, which pushes Kerryon Johnson (DK: RB10, FD: RB19) out of contention. Johnson averaged 13.5 carries per game, 7.5 targets per game, and played on 70% of the snaps the last two weeks with Riddick out. In his first five games, he averaged just 10.0 carries per game, 3.0 targets per game, and played on only 40% of his team’s snaps. Cooper Kupp (DK: WR15, FD: WR14) is expected back for Sunday’s game against the Saints. Kupp ranked fourth among all wide receivers in fantasy points before his early exit in Week 6. He’ll have a soft draw against a Saints defense giving up the fifth-most fantasy points per game to opposing slot wide receivers. This also kicks Robert Woods (DK: WR10, FD: WR8) back outside. He’ll have a soft draw against Eli Apple, while Brandin Cooks (DK: WR12, FD: WR9) runs at least half of his routes (and maybe all) against Marshon Lattimore. Melvin Gordon (DK: RB2, FD: RB2) is questionable, but trending in the right direction. If Gordon is out, Austin Ekeler (DK: RB24, FD: RB20) becomes a lock-button must-play. With Gordon out in Week 7, Ekeler played on 95% of the team’s snaps, drawing 12 carries and seven targets. 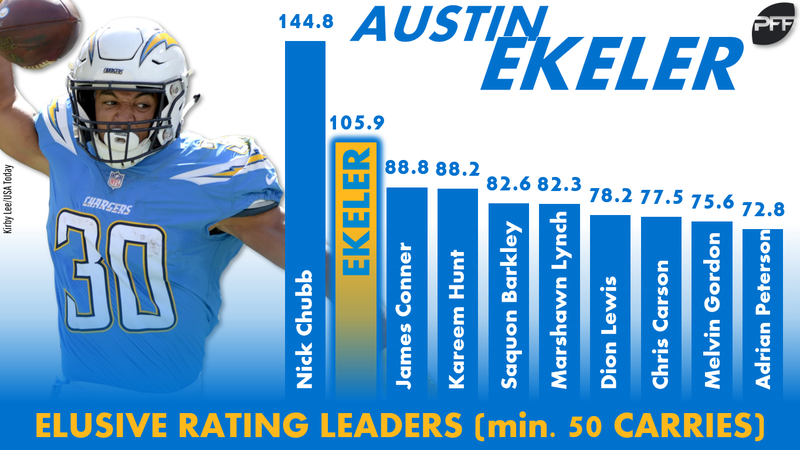 Ekeler is our highest-graded running back and is second in elusive rating. Antonio Callaway (DK: WR39, FD: WR52) and Rashard Higgins (DK: WR51, FD: WR62) are both questionable for Sunday’s game, with Higgins being more likely to play of the two. If Callaway is out, and I expect he will be, Higgins becomes a decent punt-play. If both are out, I’d consider Damion Ratley (DK: WR56, FD: WR62). Keke Coutee (DK: WR21, FD: WR27) is questionable for Sunday, but expected to play. If he’s out, DeAndre Hopkins (DK: WR3, FD: WR3), Demaryius Thomas (DK: WR33, FD: WR29), and Ryan Griffin (DK: TE29, FD: TE27) all get significant projection boosts. Royce Freeman is truly questionable for Sunday’s game against the Texans. If he’s out, Phillip Lindsay (DK: RB11, FD: RB12) becomes a decent-to-good value play in a below average matchup. Last week, Lindsay led Denver’s committee over Devontae Booker, drawing 18 (of 27) carries and three (of seven) targets on 56% of the snaps. Chris Carson (DK: RB20, FD: RB16) is questionably but likely to play this week. When Carson sat out in Week 4, Mike Davis (DK: RB44, FD: RB38) played on 71% of the snaps, drawing 25 of 34 backfield touches and totaling 124 yards and two scores. If Carson is out, Davis would become a top play. Chris Thompson is out and Kapri Bibbs (DK: RB42, FD: RB47) is questionable (probably closer to probable). In the two games Thompson missed earlier in the year, Bibbs totaled just four carries and seven targets. Thompson’s absence should mean more work for Adrian Peterson (DK: RB9, FD: RB8), who has a great matchup on paper. The Falcons are giving up the second-most fantasy points per game to opposing running backs and are very beatable on the ground, though the bulk of that has been through the air while Peterson has averaged just 1.9 targets per game. Peterson is seeing RB1 volume, but has also been wholly gamescript-dependent, averaging just 10.0 touches per game in losses. That could be a problem this week, as the spread is close (only 1.5-point favorites). Xavier Rhodes is questionable for Sunday, and his status will play a big role in which of Detroit’s two wide receivers I’ll want to play. If Rhodes is active, I’ll steer clear of Marvin Jones, who would draw him in shadow coverage. Yes, Jones caught five balls for 92 yards and two scores when lined up against him last Thanksgiving, but in his other three games against Rhodes, Jones totals only three catches for 50 yards (on 10 targets and 67 routes). Golladay, meanwhile, would have the softer draw against Trae Waynes and Jayron Kearse. If Rhodes is out, I’ll play Jones due to better projected usage (he ranks 22 spots higher in expected fantasy points per game). Stefon Diggs (DK: WR11, FD: WR11) is a game-time decision for Sunday’s game, while Darius Slay (who was projected to shadow him) is also questionable, but far more likely to play. 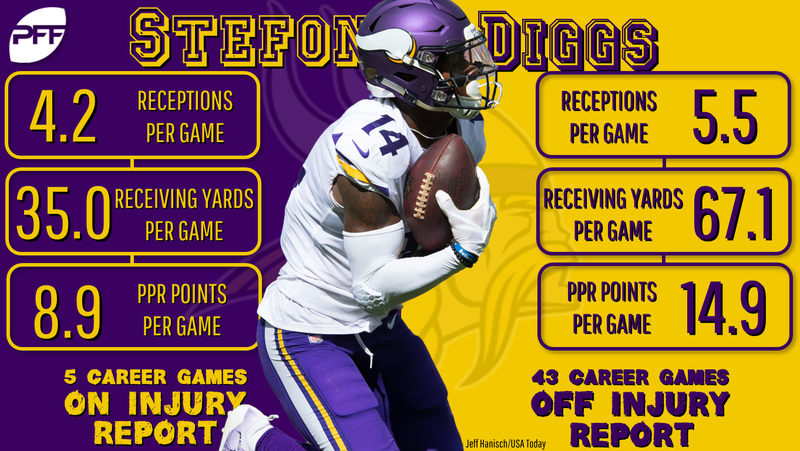 Diggs, who has not played well when on the injury report, is not in play for me this week. The fact that he’s missed practice all week, and especially if he’s out, means a likely boost in targets for Adam Thielen (DK: WR1, FD: WR1), who was already a great play against the Lions. The Lions are giving up the ninth-most fantasy points per game to slot wide receivers, and Thielen has our top individual cornerback matchup of the week against Nevin Lawson. Kenny Stills is legitimately questionable for Week 9. If he’s out, that would keep DeVante Parker (DK: WR32, FD: WR29) in play. Parker saw tremendous volume last week, totaling 16.5 expected fantasy points, or 13th-best at the position. This was also 40% more than any other receiver on the team. Jarvis Landry (DK: WR13, FD: WR18) ranks third among wide receivers in expected fantasy points per game, fifth in targets per game (10.6), and sixth in expected touchdowns per game (0.64). Of course, production has been nowhere near as good, but maybe Cleveland’s new offensive coordinator can coax better efficiency out of Landry. It might be hard to stomach, but the matchup is slightly above average (Kansas City is giving up the 11th-most fantasy points per game to opposing wide receivers), and Landry is still easily one of the top volume-based value plays on the slate. 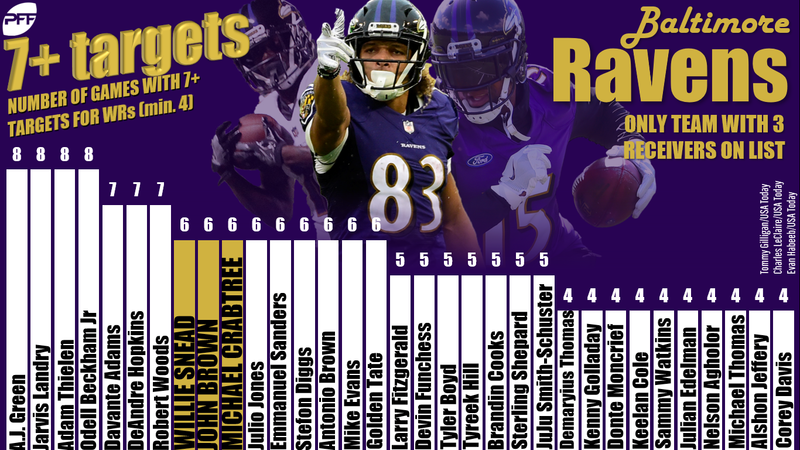 Willie Snead (DK: WR39, FD: WR43) has seen at least seven targets in each of his last five games. Over his last three games he averages a team-high 9.3 targets per game and 16.4 expected fantasy points per game (ninth-most among all wide receivers). He also has one of the best matchups of the week, against a Steelers defense that is giving up the third-most fantasy points per game to opposing slot wide receivers (where Snead runs 83% of his routes). O.J. Howard (DK: TE6, FD: TE4) is our highest-graded tight end this year and averages 14.0 fantasy points per game in games he started and finished. That ranks fifth-best at the position. He also draws the best possible tight end matchup of the week, against the Panthers, who rank worst in schedule-adjusted fantasy points per game allowed to opposing tight ends. Nick Chubb (DK: RB23, FD: RB14) averages 18.0 carries and 2.5 targets per game over the last two weeks, despite Cleveland leading on only 32% of their plays over this stretch. Gamescript is unlikely to be good against the Chiefs, as 9.0-point underdogs, but the matchup is great on paper. Kansas City ranks second-worst in yards per carry allowed (5.31) and are giving up the most fantasy points per game (32.4) to opposing running backs. Danny Amendola (DK: WR31, FD: WR40) has averaged 7.7 targets and 16.3 fantasy points per game in the three games Brock Osweiler has started. Osweiler will be starting again this week, against the Jets who are giving up the second-most fantasy points per game to opposing slot wide receivers. That’s where Amendola runs 80% of his routes. Over the past two seasons, Devin Funchess (DK: WR19, FD: WR21) has averaged 3.4 fantasy points per game less with Greg Olsen in the lineup but draws a near-ideal matchup this week against a Tampa Bay defense that ranks worst in schedule-adjusted fantasy points per game allowed to opposing WR1s. After an impressive preseason, Tre’Quan Smith (DK: WR39, FD: WR49) burst onto the fantasy scene in Week 5 with a three-catch, 111-yard, two-touchdown performance (on three targets). Since then, he’s seen just 10 targets in two games but, adjusting for Drew Brees’ low passing volume, that’s actually a 20% target market share. Over the past three weeks, he’s seen a team-high four deep targets, and the Rams are giving up the second-most fantasy points per game to wide receivers on deep passes. He should also run the most routes against Troy Hill, who has given up 280 yards and two touchdowns over the past three weeks. Through eight weeks Mahomes has scored 243.9 DraftKings fantasy points. Among quarterbacks, only Peyton Manning in his famed 2013 season has ever scored more through the first eight weeks of the season, and just by 3.3 fantasy points. At $7,100, Mahomes is the highest-priced quarterback on DraftKings this week, but that’s also over $2,100 less than Manning’s average salary in 2014. The matchup isn’t ideal but I don’t think that matters. Mahomes has scored over 28.0 DraftKings fantasy points in six of eight games. The two games he didn’t were two of the most difficult matchups a quarterback could have, and he was still highly effective – 25.9 DKFP at Denver and 20.8 DKFP against Jacksonville. Actually, he wasn’t just effective, he was again historically great. His 313 passing yards against Jacksonville was the most they have allowed since the 2016 season. His 304 passing yards against Denver was the most by a road quarterback against them since the 2014 season. The 2018 Tampa Bay Buccaneers are on pace to be the worst pass defense of the past decade, and it’s not even close. They’re on pace to set records in passing yards allowed (5,323), passing touchdowns allowed (45.7), yards allowed per attempt (8.76), completion percentage allowed (73.7%), interceptions surrendered (2.29), and opposing passer rating (123.5). Now they get Newton – who is just 0.2 fantasy points per game away from his career high from 2015 (when he won the MVP) and ranks third at the position in FanDuel fantasy points per game, behind only Mahomes and… Ryan Fitzpatrick. If combined into one player, Fitzpatrick and Jameis Winston are averaging more fantasy points per game than any single quarterback ever. The 2018 Buccaneers are just four yards away from the record set by the 2000 “Greatest Show on Turf” Rams for most passing yards by a team through their first seven games of the season. Fitzpatrick, of course, has also been the far more efficient one of the two, leading the league in passer rating and ranking second-best in PFF grade, while Winston ranks 29th and 31st, respectively. As Adam Levitan showed here, in games with an over/under this high, it’s really hard for the quarterbacks involved not to “smash.” The over/under being so high as well as the close spread (1.5 points) both imply Vegas thinks this is going to be a pass-heavy shootout. As for Goff, this seems to be the matchup we’ve all been waiting for – one where he’ll finally be forced to pass. Over the past two seasons, Goff ranks fifth-best in fantasy points per dropback and second-best in adjusted net yards per attempt, but just 27th (of 31 quarterbacks) in dropbacks per game. A pass-heavy approach makes sense given New Orleans is the toughest offense they’ve faced all year, or at least since Week 4 against the Vikings (when Goff dropped 465 yards and five touchdowns). The Saints are also the league’s most egregious pass funnel defense. They rank best in the league in yards per carry allowed (2.87) and rushing yards allowed per game (50.4), while ranking fifth-worst in passing yards allowed per game (315.7). In fact, 80% of their yardage allowed has come via the pass (most), and they rank bottom-three in opposing passer rating and fantasy points allowed per dropback. Brees is a tougher sell compared to the other four, or, at least tough as far as “Brees favored at home with a 31.0-point total” goes. With Mark Ingram back, New Orleans has shifted back toward their run-heavy approach from 2017, and especially in the red zone (with Taysom Hill also stealing those valuable snaps). Of course, positive gamescript played an important factor, but “on the ground” is also how you’d want to attack the Rams. Over the past two seasons, Los Angeles ranks second-worst in yards per carry allowed (4.72) but sixth-best in opposing passer rating (82.6). Still, he’s Drew Brees, favored, at home, with a close spread and a 31.0-point total. If this slate were to hinge on one game, it would probably be Los Angeles @ New Orleans – you know, the game with an over/under 5.5 points higher than any other on the main slate. So that raises the question: What do we do here? Do we play the quarterbacks listed above? We already mentioned love for Cooper Kupp, Robert Woods, and Tre’Quan Smith, so a stack makes sense. Or, what do we do with the running backs, including Todd Gurley, the most expensive player on the slate. In each of the past two seasons, in addition to fantasy points per game, Gurley (DK: RB1, FD: RB1) also leads all players at all positions in: expected fantasy point market share, yardage market share, touchdown market share, and touchdown market share. Over the past two seasons, he’s seen 35% of the Rams’ total yards and 47% of their total touchdowns. That’s despite missing one game and routinely getting taken out at some point during their league-high eight 20-plus-point victories over this span. What does this mean? It means if you think the Rams hit their 29.25-point total, Gurley is still the one you want to own. Yes, he’s the highest-priced player on both sites. That’s true. However, based on his production, he’s still underpriced. He has scored 240.1 fantasy points this season, or the second-most by any player at any position through eight weeks all time. He’s only $9,500 on DraftKings. I count 27 instances of a player being at least that expensive over the past two seasons. Similarly, Alvin Kamara (DK: RB6, FD: RB4) ranks behind only Gurley and Melvin Gordon in fantasy points per game, and behind only Gurley in expected fantasy points per game, expected touchdowns per game, and expected fantasy point market share. Of course, Ingram’s absence played a role, but maybe by less than you’d think. Over Kamara’s last seven healthy games (didn’t leave early, wasn’t on the injury report) with Ingram in the lineup, he averages 18.2 expected fantasy points, 19.2 actual fantasy points, and 0.77 expected touchdowns per game. Ingram averages only 10.3, 12.0, and 0.30, respectively. Over the past two weeks. Kamara also out-totals Ingram in carries (30 to 25), targets (10 to 5), and carries inside the 5- (3 to 0) and 10-yard lines (6 to 2). Ingram is also in play, but I personally prefer Kamara. As we mentioned earlier, Mike Evans looks like a great play with Ryan Fitzpatrick under center. Dating back to last season, and excluding Week 10 of that year (a game Evans missed), Evans averages 10.1 targets and 21.4 fantasy points per 40 pass attempts with Fitzpatrick under center. That probably makes him the top wide receiver play on FanDuel and one of the top plays on DraftKings. As mentioned earlier, Adam Thielen has our top WR/CB matchup of the week and Stefon Diggs is legitimately questionable. Even if Diggs plays, he’s unlikely to be 100% and will more than likely be negated anyway in a brutal matchup shadowed by Darius Slay. 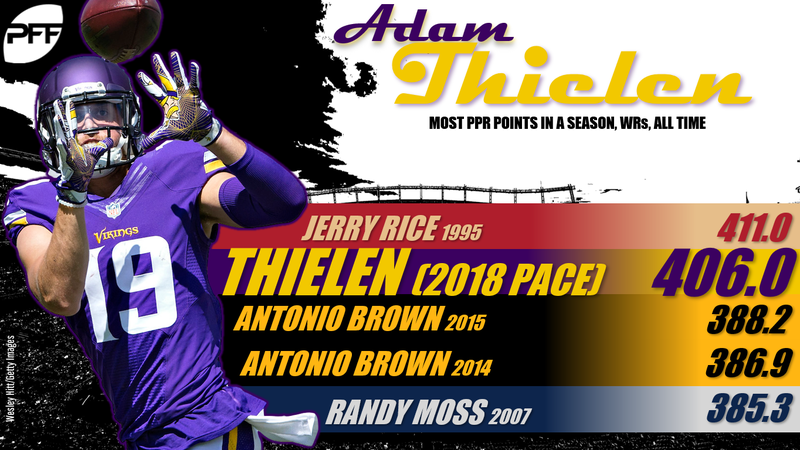 Even without these factors working towards his advantage, it would be hard to bet against Thielen. By DraftKings scoring, he has 227.0 fantasy points, which is the most by any wide receiver through the first eight weeks ever. Next-closest is Bobby Mitchell in 1962 with 221.3. Though he’s the highest-priced wide receiver on both sites, he still feels too cheap. Since 2016, DeAndre Hopkins (DK: WR3, FD: WR3) averages 2.4 more targets per game with Will Fuller out of the lineup. Now, Keke Coutee might be out as well, leaving Hopkins alongside Demaryius Thomas, who just joined the team this week. With Bradley Roby out and Chris Harris Jr. in the slot, Hopkins will mostly face off against Tramaine Brock and Adam Jones. This is probably Hopkins’ softest matchup of the year, with his highest target projection of the year, and after three brutal matchups in consecutive weeks. Michael Thomas (DK: WR7, FD: WR4) has disappointed since Mark Ingram returned to the lineup, but he led all players in fantasy points through the first three weeks of the season, when Drew Brees was more willing to pass. Brees averaged 43.0 pass attempts per game over this stretch, but has averaged just 28.5 since. He’ll likely need to go pass-heavy this week, and with a 30.0-point implied point total, Thomas has massive upside. The tight end position has been brutal all year and is especially so this week. That’s why paying up for Travis Kelce (DK: TE1, FD: TE1) makes sense. He leads all main slate tight ends in fantasy points per game by 5.7. He’s the lone dependable option this week and isn’t terribly priced. … We mentioned O.J. Howard earlier, and Greg Olsen (DK: TE3, FD: TE2) is in a similarly good matchup and has been seeing decent usage. … If you wanted to completely punt the position I wouldn’t blame you. If so, I’d be looking at names like Ryan Griffin (DK: TE29, FD: TE27), Michael Roberts (DK: TE29, FD: TE12), and Jeff Heuerman (DK: TE19, FD: TE16).